For more information, visit http://www.tikka.fi/rifles. To buy a Tikka T3X rifle on GunsAmerica.com, click this link: https://www.gunsamerica.com/Search.aspx?T=Tikka%20T3X. The author was extremely impressed with the Tikka T3X TAC A1 at the 2017 SHOT Show. Tikka is going full tactical with their T3x TAC A1. Based on their advanced T3x action the TAC A1 model is a fully adjustable, modular design with a sleek rail system, new for 2017. 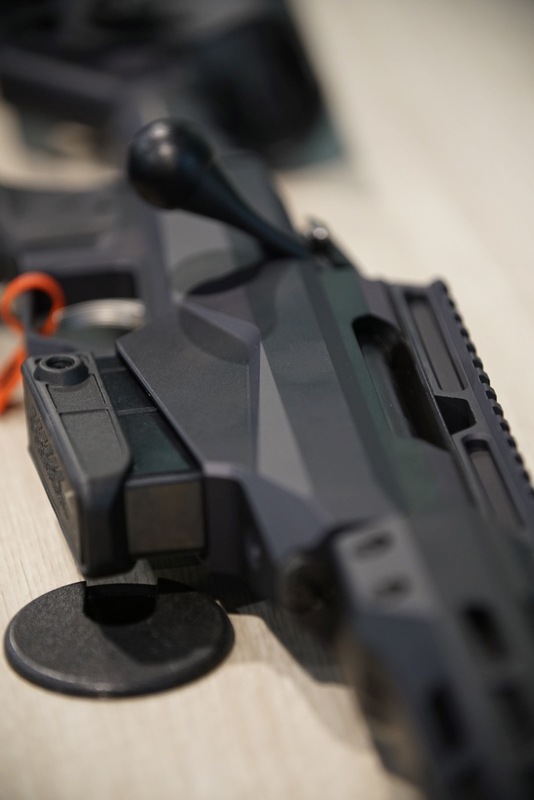 While Tikka has long made guns that cater to the black rifle crowd the new TAC A1 is a bolt-action rifle with a completely modern feature set. It comes from the factory with an extended free-floating handguard, adjustable folding stock and more. The chassis of the rifle is well designed and can accept AR-pattern accessories. The handguard sports a 0-MOA Picatinny rail at the 12-o’clock position for night vision adapters and other accessories. The rest of the handguad uses M-Lok cutouts for accessories and to cut weight. This allows users to completely customize how they configure their rifle and opens up a lot of options for things like bipods and sling setups. The handguard is detachable and shooters can swap it out for compatible free-floating AR-15 handguards. The stock is fully-adjustable. The cheek riser, the buttpad and the length of pull are user-adjustable for the perfect fit. On the bottom of the stock is a rail for monopods. The stock also folds to the side for storage and improved maneuverability in the field. One neat thing about the TAC A1 is that the stock mount is compatible with AR-15-style stocks. This allows users to install a minimalist stock on for a lighter package or swap out the factory stock for something completely different. It also uses AR-15-pattern pistol grips. The TAC A1 feeds from 10-round double-stack magazines and is chambered for three cartridges. Shooters have the choice of .260 Remington, .308 Winchester and 6.5 Creedmoor. The rifle will also have several barrel length options, 16-, 20- and 24-inches. 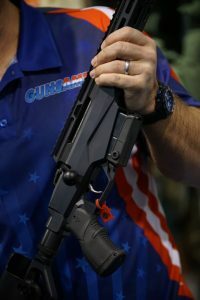 Tikka says the 16-inch models are for military and law enforcement customers but there is nothing stopping them from selling them to the general public as well. And of course, the rifle also has a user-adjustable 2-stage trigger. The trigger is adjustable from 2.2 to 4.4 pounds. The barrel has 5/8-24 threads for muzzle devices and comes with a 3-baffle muzzle brake. The rifle feeds from well-designed detachable box magazines and comes standard with three of them. The half-AR, half-bolt gun is going to be a big thing for rifle manufacturers from here on out. Tikka is not only one of the first major manufacturers to get one of these tactical rifles into production they did a good job of making the gun work with AR components. One thing that it does not come with is a scope or scope mount. Since this is a personal decision for a lot of shooters it’s probably a good thing. While traditional wood stocks are never going away it’s rifles like these that will draw the attention of practical-tactical crowd. It may look like a rifle for police snipers, but guns like the Tikka T3x TAC A1 will soon be the go-to rifle for hunters and recreational shooters across America and around the world. This gun is a bolt-action, magazine-fed wonder of engineering. Chambered in 6.5 Creedmoor or .260 Remington, the barrel is a perfect balance of being thick enough to shoot seriously, while thin enough not to feel like a benchrest gun. It ships with three magazines, which is a bargain for anyone looking to shoot PRS. 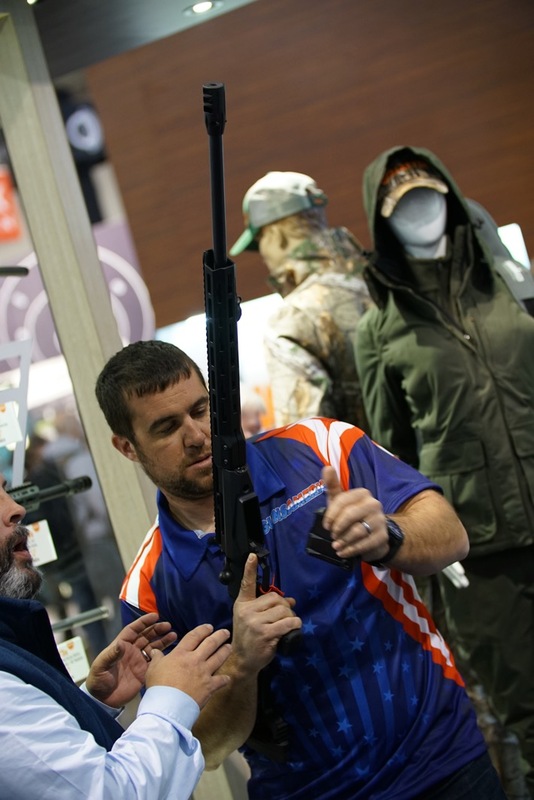 I see lots of guns at SHOT Show I want to test or review, but few I would write a check for in the booth. The Tikka T3 TAC A1 is an exception to that rule. If you want one, you better get on the list. Your name will be right below mine. To be honest, I found the pricing of the rifle shocking, with an MSRP of $1,899. This is a lot of gun for the money and I for one an really looking forward to trying one out. Keep an eye out for a full review of this in the near future. how accurate is the creedmore? When are these guys or Ruger going to put out a precision / chassis style bolt action in 300 Win Magnum. Come on Man! Who doesn’t already own a short action chambered bolt action rifle already? For sure Fred. Too damn expensive right now. 1) Someone like Clay – an experienced ex military guy. 2) An experienced long range competition shooter. 3) An experience shooter, but one who doesn’t shoot long range – maybe someone who is usually a hand gun guy (or gal). 4) And one or two novice shooters. I’m almost finished putting together my new Savage BA10 Stealth and definitely would have looked at the Tikka if I had heard about it a month earlier. __ Both are known for great accuracy. The BA10 got a great review on GA, and Clay seems to really like the Tikka. __ Both come with some pretty nice furniture and are AR compatible so you can customize the heck out of them. __ The Savage MSRP is about 2/3’s that of the Tikka – but you get a few more parts with the Tikka to make up some of the cost difference. __ A plus for Tikka: it comes with three magazines where the Savage only comes with one. __ A plus for the Savage: mags for the Savage come from Modular Driven Technologies, mdttac.com, and you get three for the cost of one from Tikka. If you have 4 total, you break even. At 5+ the Savage wins. __ The Tikka comes with a muzzle break, the Savage only has a thread protector. If you like the muzzle break, Tikka wins. If you take if off and put on another one or a silencer, the thread protector would have been better. So many choices – and none of them bad! Keith, brilliant idea! I second it. Come on GoA, think about it! Please say they will offer a left handed configuration. Ruger really missed the mark on that. Golf balls at 800? well if thats the case its worth the $$$ , what optic? and handloads? For $2000 I have my whole setup with my Ruger Precision in 308 and shooting 3/4 to 1 moa at 600 yards all day every day. Mike their all like Yugos compared to the custom rifles those PRS guys are using.